With smiles being the most recognized symbol of happiness, welcome, or excitement around the world, it’s no wonder why Dr. Azizzadeh works to bring his patients the most advanced facial paralysis treatments to promote facial symmetry and facial reanimation. At the Facial Paralysis Institute in Beverly Hills, expert facial paralysis surgeon Dr. Babak Azizzadeh believes that through continued research and support, even more treatments will be made possible for patients in the coming years. At the Facial Paralysis Institute in Beverly Hills, Dr. Azizzadeh provides patients with an array of different surgical and non-surgical procedures to fit their unique needs. Today, one of the most cutting edge treatments for facial paralysis, pioneered by Dr. Azizzadeh, is the masseter to facial nerve transfer. This procedure has a very high success rate in helping paralysis patients regain the ability to move the paralyzed side of their face. For patients suffering from permanent facial paralysis, one of the most sought after and technologically advanced procedures is the masseter to facial nerve transfer. During this procedure, Dr. Azizzadeh and his team of facial paralysis experts, makes an incision near the front of the ear. The facial nerve and masseteric nerve are identified and sewn together under microscopic magnification. The masseteric nerve, provides neural input into the paralyzed facial nerve, thereby restoring the facial muscle function and ability to smile. Within about 6 to 7 months, the paralyzed side of the face begins to regain function resembling the unaffected side. 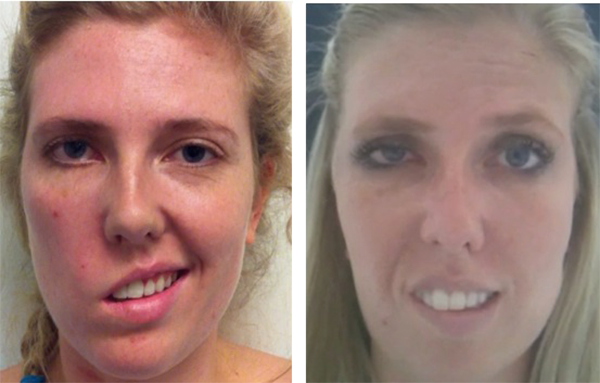 The strength and control of the reconstructed smile continues to improve over the next several years. For those who may not be familiar with facial paralysis, the term is used to describe someone suffering from either permanent of temporary loss of facial muscle control on one side of their face. Facial paralysis has several different forms, with the most common known as Bell’s palsy, a temporary type that occurs as a result of an inflamed facial nerve due to a virus. Permanent facial paralysis, however, is usually due to trauma that has affected the facial nerve in the past. In either condition, Dr. Azizzadeh brings patients treatment options that can be tailored to meet their individual needs. No matter what type of facial paralysis you might be suffering from, Dr. Babak Azizzadeh and his team of experts are here to help you overcome your condition. If you’d like to learn more about the truly revolutionary treatments available through Dr. Azizzadeh at the Facial Paralysis Institute in Beverly Hills, please call our medical center today at (310) 657-2203 to schedule you initial consultation, during which your every question and concern will be addressed. Dr. Azizzadeh is a Harvard trained facial paralysis specialist who works to bring patients their smiles back through the most advanced non-invasive and surgical procedures to date. For additional information, please call the Facial Paralysis Institute to learn more about the best treatment options for your unique case.